so i was all like: i am so over summer sewing… you should use summer/fall transitional fabrics… blah, blah, blah… don’t listen to me. i certainly never do. a while back i was obsessing over this really cute linen/cotten blend fabric but didn’t get it, it was out of stock or something. so the other day it was on sale at fabric.com and decided i had to have it. yes, it was the end of august and i’m in new england so winter comes early… just means i need to sew fast, right? 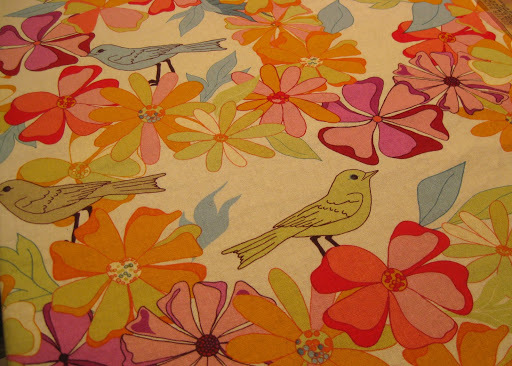 and yes, there are birds on the fabric. what of it? it’s cute. at least it doesn’t have elephants on it. i’m not knocking the elephant dress, i’d totally wear it. back to my dress… i have this pattern (new look 6457) i’ve wanted to make all summer but hadn’t gotten around to it. but if summer hangs on the way winter did this year, i’ll still get to wear it a few times! here goes… i will be underlining this in muslin for stability and lining it as well. i want a nicely structured and fitted bodice, but also want it smooth and comfy on the inside with no scratchy seams. the lining i’m using is cotton voile. now, this stuff is very lightweight. it’s only purpose is to cover my seams. someday i’ll splurge and line my dresses in silk… until then this will have to do! since this was a fairly easily adjustable princess seamed bodice i went with a tissue fitting instead of a full out muslin. i traced the pattern pieces to my starting off point and cut them out. 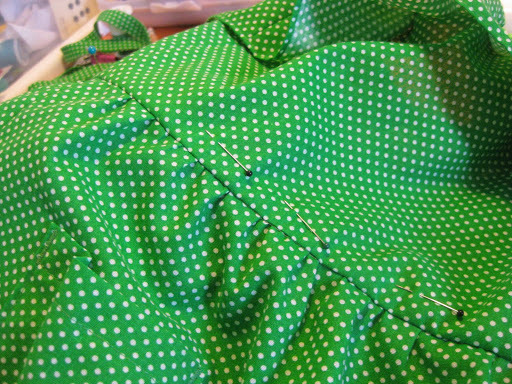 i marked the seam allowances and pinned the pieces together along the seam lines and held it up to me. i made the necessary adjustments, re-traced the pieces and pinned them together again. the only changes i’m making to the pattern style is to eliminate the top strip of material and instead will use some flat piping peeking out of the top. also, i’m changing it to a sweetheart neckline. i used to hate sweetheart necklines… now i kinda like them, who knew? pretty sure of my fit, i cut out my pieces in muslin and basted them together to try it on in actual fabric. i still had to take the top in a little, but all in all i’m pleased with it. on to cutting my actual fabric! “tremor envy” anyone? so yesterday an earthquake shook up and down the east coast. while i am certainly in the area that felt this… i totally missed it. i kinda feel left out. after all, since moving to the northeast two years ago we’ve experienced blizzards, tornadoes and soon a hurricane… feeling an earthquake is about the only thing left on the list of natural disasters to experience, right? i know, i’m weird. 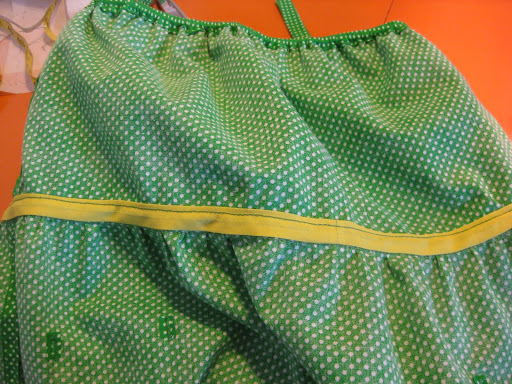 on to the skirt portion of the dress… first, attach the pockets, if desired. 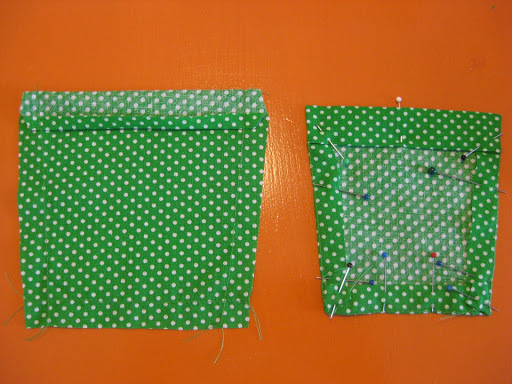 i made mine to pouch out slightly at the top so when cutting them i flared the edges slightly but stitched them on with the corners at right angles. 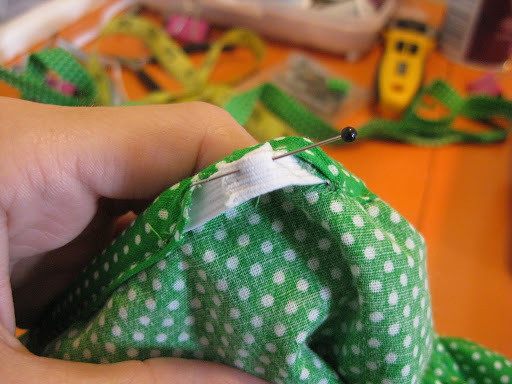 make sure to reinforce the top corners with extra zig-zag stitches. 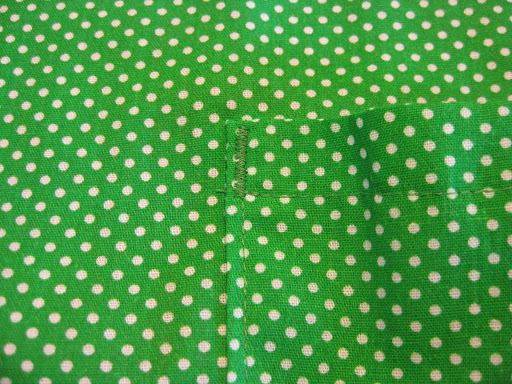 if the material is thin, add a little patch (cut on the bias to reduce fray) to the underside of the skirt at the corners before zig-zagging. see that little excess from the flare? just snip it off. 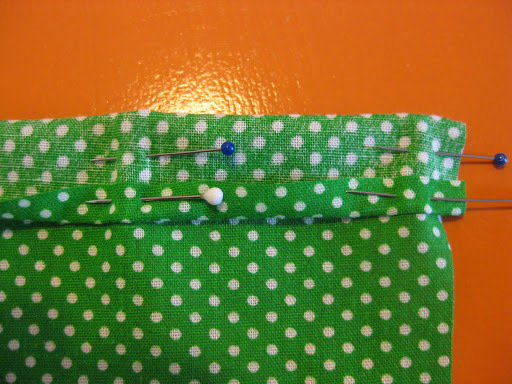 turn the upper edge of the pocket and using your stitching as a guide, pin the edges of the pocket in and press. 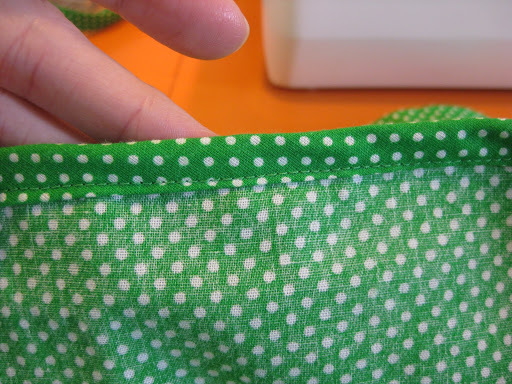 also, stitch across the little hemmed edge on the upper part of the pocket. 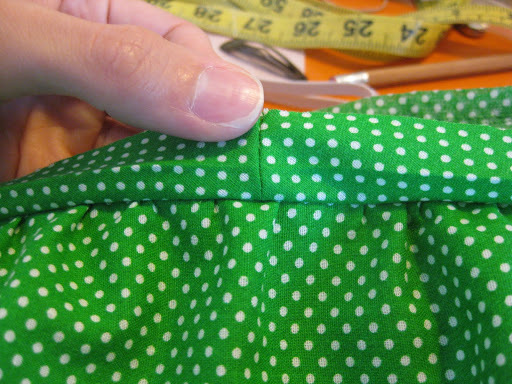 stitch together the side seams of the skirt and finish the seam allowances. (if the skirt is a little see-through, you may need a lining. 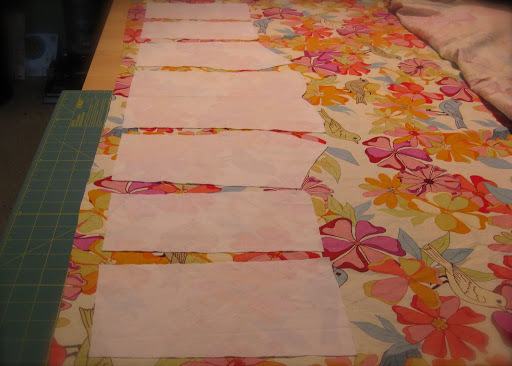 just cut it the same as the main fabric only 1 1/2″ shorter.) 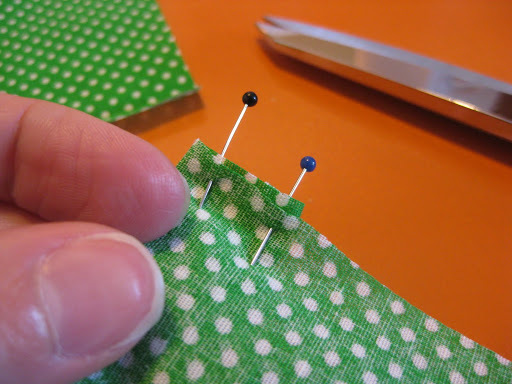 make two rows of gathering stitches at the top of the skirt piece and pin it to the bodice. 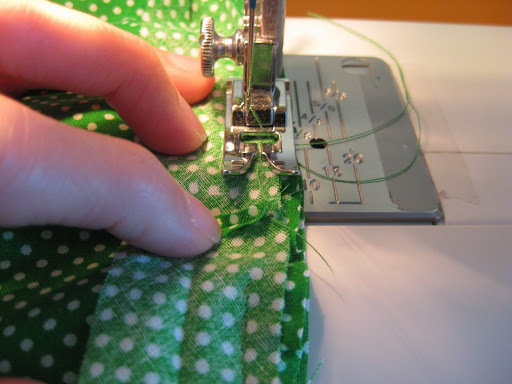 draw up the bobbin threads to distribute the gathers evenly and stitch in place. zig-zag the gathered edge and trim. now to make the casing for the elastic, take a piece of bias tape (a few inches longer than the bottom edge of the bodice) and press out the center fold so that you are left with the top and bottom folded in to the center. 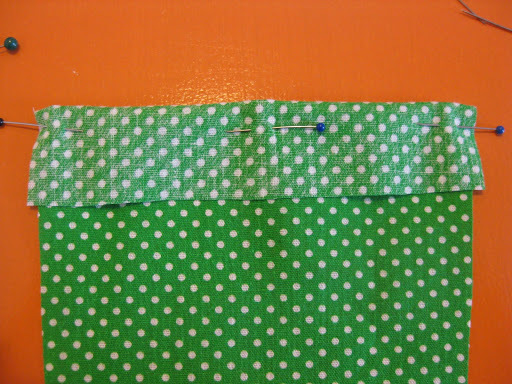 pin the bias tape to the top edge of the skirt and stitch all the way around, leaving 1″ open. 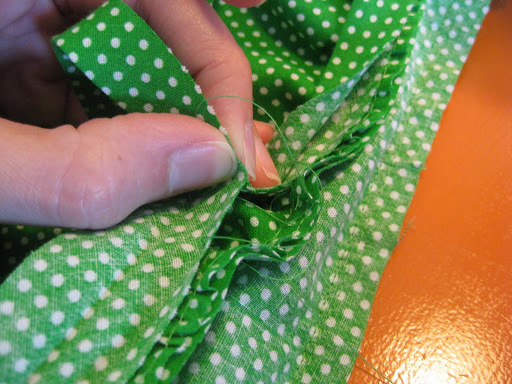 your stitching should be right over your previous stitching where you joined the skirt and bodice. 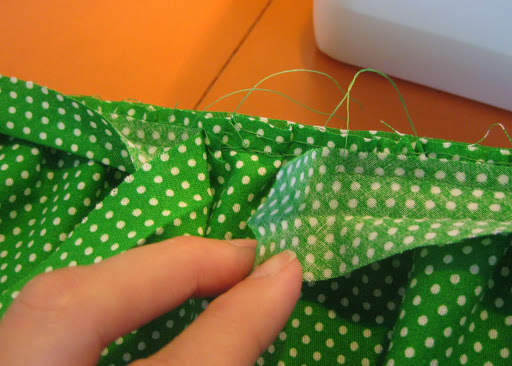 sew and trim the bias tape as before to join the edges. finish stitching the bias to close the opening. 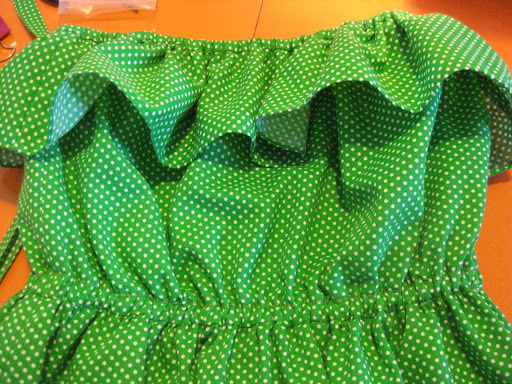 fold the bias tape up and over the skirt/bodice seam allowance and pin it in place. 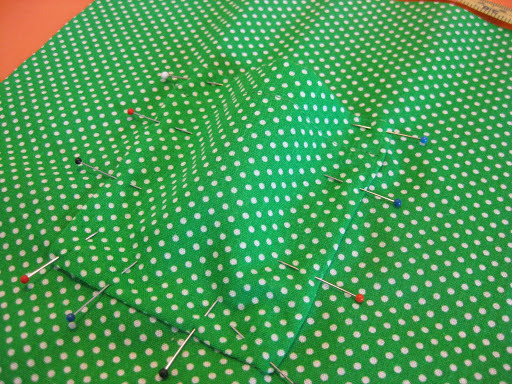 using the utility straight stitch (the stretch stitch version of a regular straight stitch) sew the top of the bias tape to the bodice. leave a 1″ opening in the casing. insert the elastic (cut a piece equal to the waist measurement) then pull the two ends out and overlap them and stitch them together. 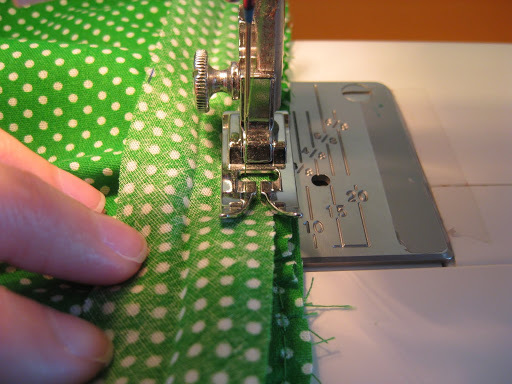 sew up the opening and hem the skirt. 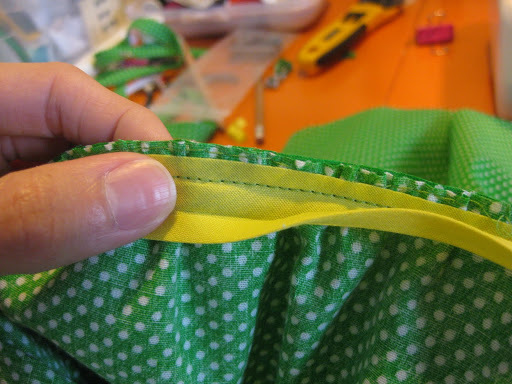 cut pieces of bias tape for straps and simply sew down both edges as near as you can to the edges. 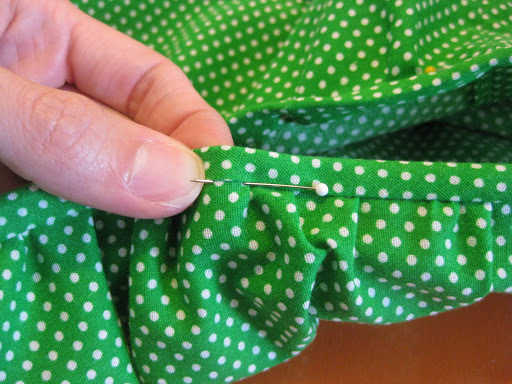 stitch them to the back edge of the bodice. decide if you want them straight or crossed in the back. try on the dress to position and pin the front straps in place. you will want them sewn right about where the top of the bodice curves down around the arms. stitch them in place and you’re done! how easy is that? wear it now while it’s still warm, then as the weather cools throw on a cardigan, leggins, a belt and you’re ready for fall! and now if you’d excuse me, i have a hurricane to prepare for. this dress comes together really fast so it’s perfect for a last minute project or something you just don’t want to labor over. i have made this one for my mini me, but it will work just as well for us grown ups! start by sewing together the side seams of the ruffle pieces and side seams of the bodice pieces. 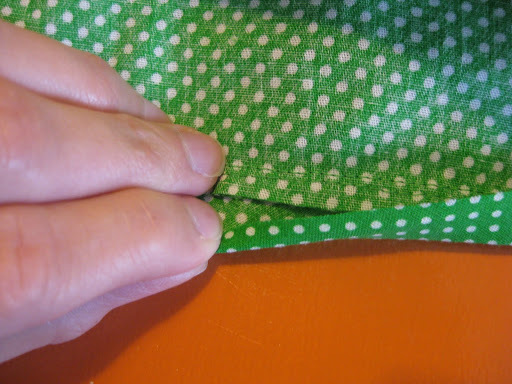 finish the seams allowances as you prefer and make a narrow hem on the bottom of the ruffle. 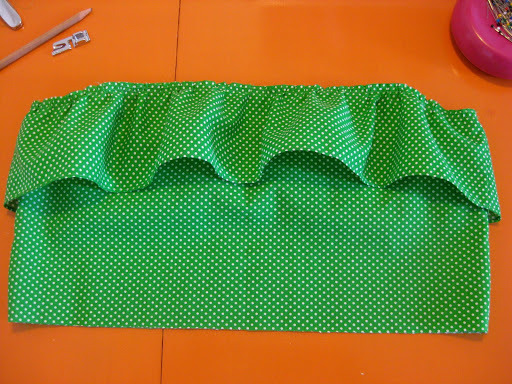 make two rows of gathering stitches on the top edge of the ruffle. 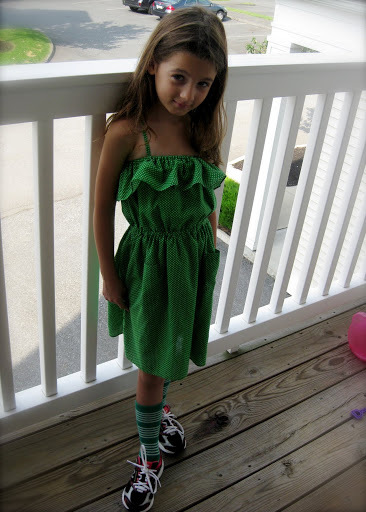 pin the ruffle at the side seams and at center front and center back. 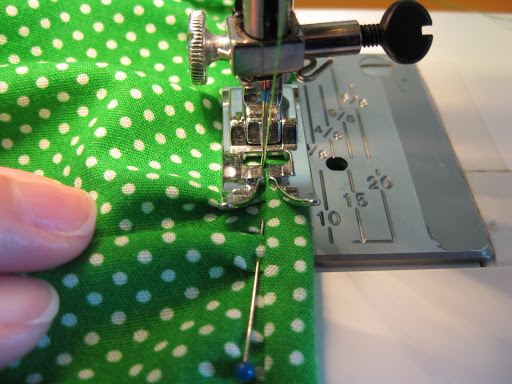 draw up the bobbin thread and distribute the gathers evenly and stitch. 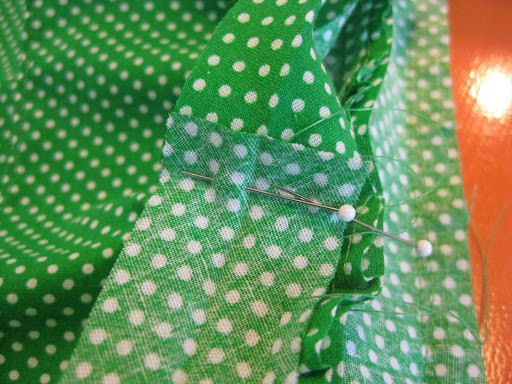 take your bias tape and pin and stitch it at the top edge of the bodice over the ruffle. leave about 1″ of tape free and unstitched at the back. 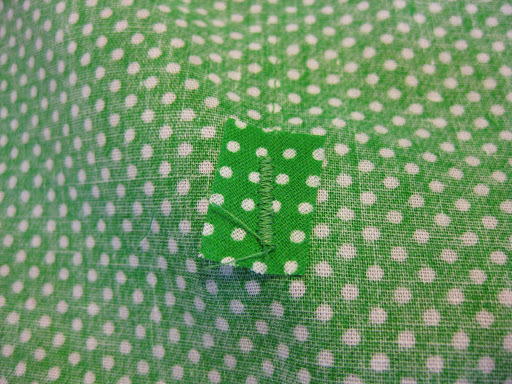 bring the bias tape together and pin it to mark where to join the tape. stitch the tape together and trim, then finish stitching it to the bodice. some reason in my head at the time… don’t know what it was though! view from the inside. remember to leave an opening to insert the elastic. measure out a piece of elastic the same as the chest measurement. 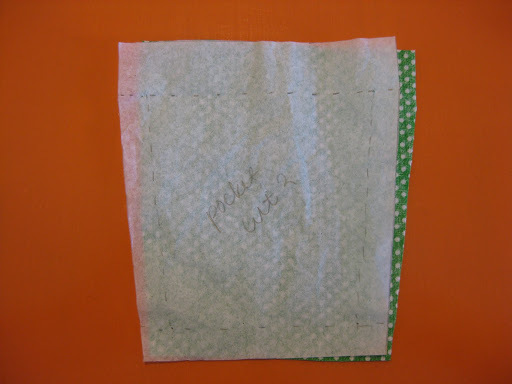 insert it into the bias tape casing then pull out the two ends, overlap them slightly and stitch them together. 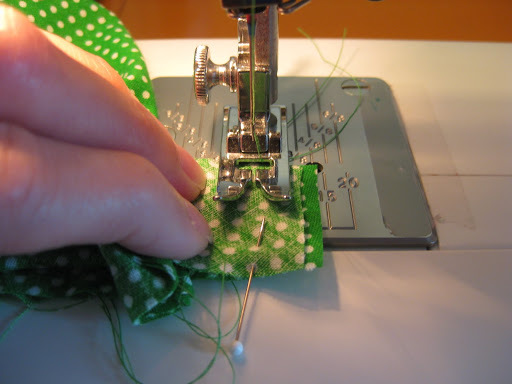 draw the elastic back into the casing and stitch the opening shut. the rest is just as easy, and i’ll finish it up tomorrow! summer seems to be slipping away. kids start school in two weeks, the hot days are less hot, the summer wear i had planned to sew hasn’t been sewn. my mind keeps wandering to fall pencil skirts and the annual halloween costume making. but, i’m not ready to give up summer quite yet and if you aren’t either, here’s the perfect “i’m not ready to give up summer!” summer dress. why is is perfect? it requires little fabric, little planning, no pattern and most importantly… very little time. being late in the summer i would make this dress in a fabric that can go into fall and be worn with my best friends “legging” and “cardigan”. perhaps you know them too? rayon would be a good choice instead of the summer go-to cotton or anything a little drape-y. if you’re into sewing with knits, that would work well here too. now, grab a measuring tape, some tissue paper, a pencil, a ruler, scissors, etc. and let’s get started! this is a blouse-y dress with an elasticized waist and neckline. since it is not a form-fitting dress you don’t really have to worry about including extra room in the pattern pieces for seam allowances. measure your chest over the bust where the neckline will sit. then measure from the neckline over the bust to the waistline and in the back down to the waistline. the total bodice all the way around will be 1.5 times the chest measurement. if you have a large bust, you may want to add a couple inches to the width of the front bodice piece. to make your bodice pieces, start by multiplying your chest/neckline measure by 1.5. on me, my measurement is 32.5″ so 32.5″ x 1.5 = 48.75″. since we need a front and back for the bodice, divide by 2 and round up. the front and back will each be 24.5″ wide. for the height, take the neckline to waist measurement and add 1″. 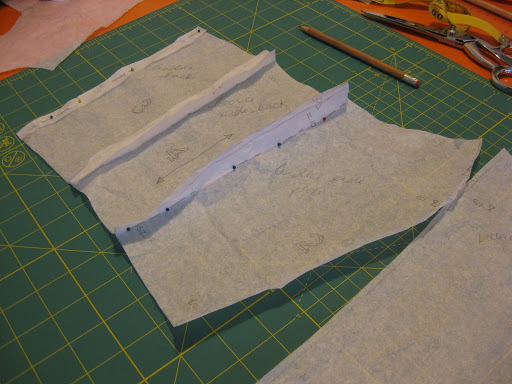 for the back bodice, my measurement is 10″ so i will need a 11″ x 24.5″ pattern piece. for the front i will need a 13″ x 24.5″ pattern piece. 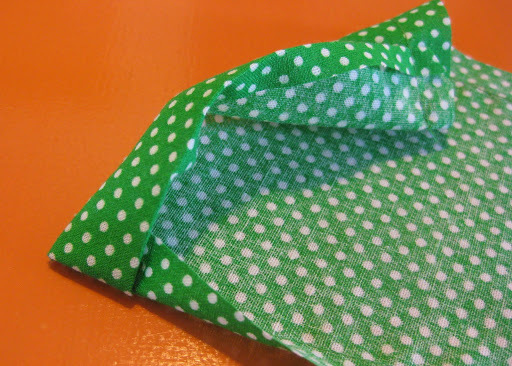 then, for the front, curve the edge down at the side seams so that the front and back side seams match up. make sure you allow plenty of room for under your arms. hold the tissue up to your body and make adjustments as needed. ruffles seem to be everywhere and i thought a little detail would be fun on this dress. make yours as wide or narrow as you want. make multiple rows, make it cascade down the front or leave it off completely. it’s up to you! 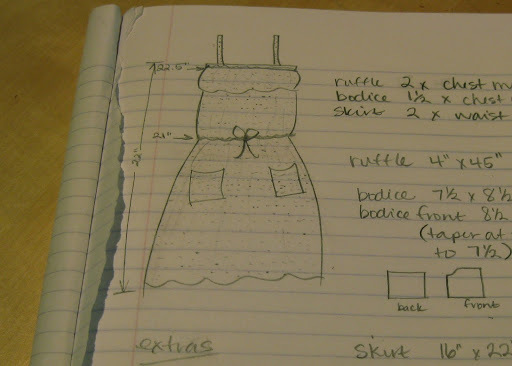 for this dress, i took the chest measurement we used for the bodice and multiplied it by 2. if you added extra to the bodice width for a larger chest, just make sure to add extra to the ruffle as well. for me, 32.5″ x 2 = 65″. again, since i need a front and back piece, divide by 2 so i need two 32.5″ long rectangles, however wide or narrow you want. so, i guess i really didn’t need to multiply and divide… i’m sure you caught that. in seam pockets are nice but for something different i went with patch pockets. to give a little extra interest, i tapered the sides out slightly but attached the pockets with right angles at the bottom corners so the pocket poufs out slightly at the opening. so there are your pattern pieces. also needed is bias tape either pre packaged or self made, and 1/4″ elastic. i apologize for the wordiness and lack of pictures but really this dress is nothing but a bunch of rectangles sewn together and i’ll be back soon to show you how! in the meantime, enjoy the last bits of summer! i’ve had calzones on my mind lately… my mom asked me for a calzone recipe the other day and i haven’t stopped thinking about them since!! this is mostly because of one amazing calzone i always have at a little dive on boston’s north end, the italian part of the city. 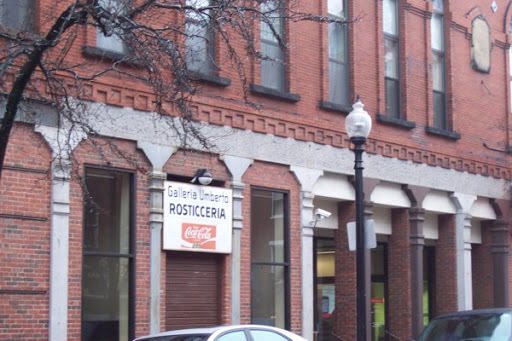 the north end is littered with heavenly pastries, smooth espresso, pasta and gourmet pizzas. 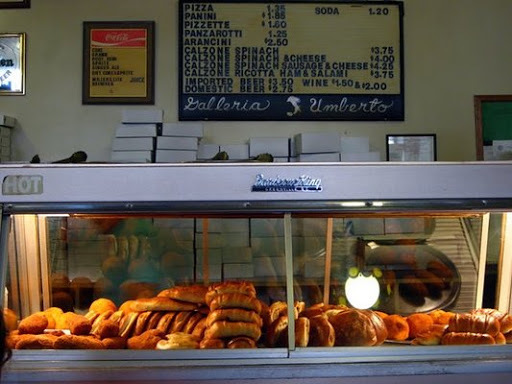 but the place we always come back to is galleria umberto. it is an unassuming place, one you’d pass right by if you weren’t paying attention. the lines are long. you have to snag a table as soon as one is available. the menu is short. the food is cheap and is served on paper plates. and the food is cheap. i mean, really cheap. now, maybe a $4.00 calzone sounds expensive as far as cheap food is concerned, but it is a calzone the size of your head. i have yet to finish one myself! their sicilian-style pizza isn’t a paper thin cracker (though i do love a good thin crust) but a thick, sauce and cheese laden square slice. 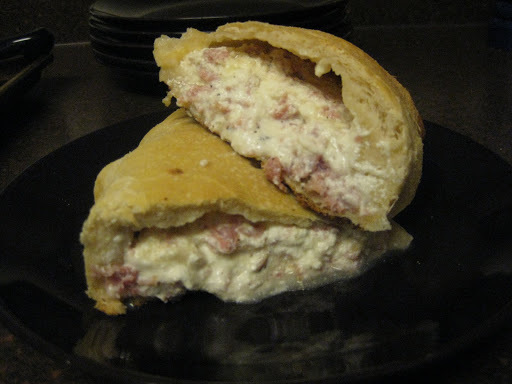 and while that is amazing, i can’t resist the ricotta, ham & salami calzone. so, when calzones were mentioned to me the other day my mind immediately wandered to umberto’s and me being me, i decided it was high time i made my own version to hold me over in between trips to boston. full disclosure here, i forgot to get salami when i made these. don’t be like me, double-check your ingredient list before heading to the store! or, if you don’t do ham, chopped sauteed mushrooms and some defrosted and drained spinach would be pretty delish too. i prefer to make my own pizza dough but you can certainly acquire it from other sources these days. 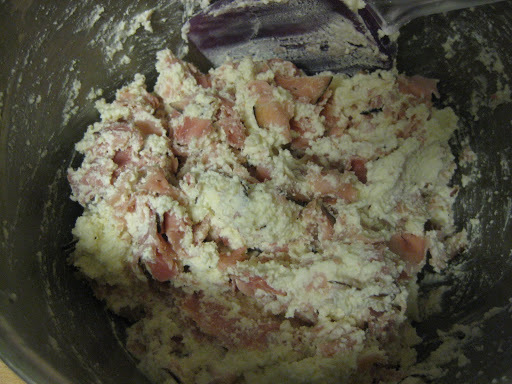 divide the dough into 4 portions, about 6 oz each, and set aside. to make the filling, combine the ricotta, mozzarella, garlic, egg yolk and salt & pepper and stir until thoroughly combined. slice the meats into 1/4″ strips crosswise and mix together, separating the strips with your fingers. add the meat to the ricotta mixture and combine. 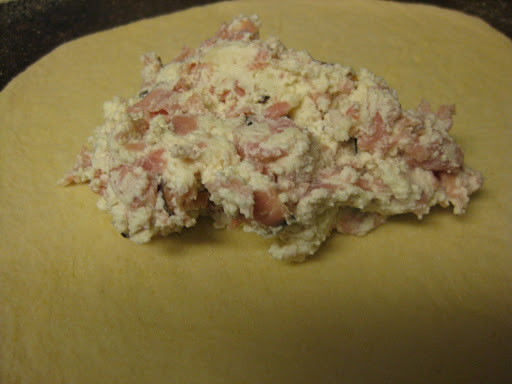 take one of the balls of pizza dough and roll it out into about a 10″ circle (amoeba-shaped is perfectly fine) and top with 1/4 of the ricotta meat mixture. 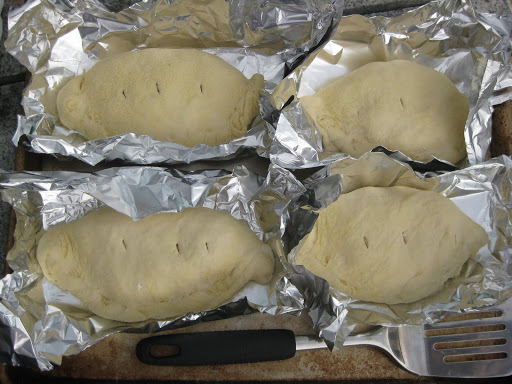 fold the dough over the filling and pinch around the edge to seal. brush the tops with olive oil, then with a sharp knife, make 2-3 small slits in the crust. repeat with remaining dough and filling. you can make these an hour or so ahead of time if necessary, just keep them refrigerated until ready to bake. i put mine on foil since i decided to take them out to the grill. 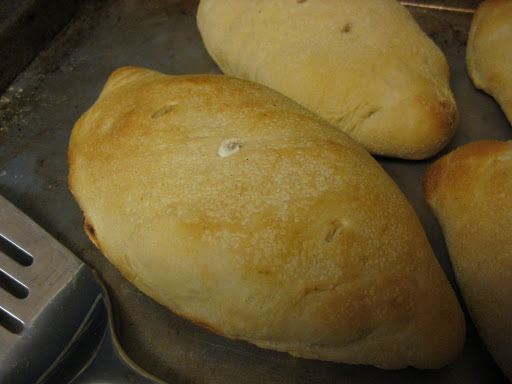 since it is summer and it was a nice day outside i grilled the calzones. there is something about grilled dough that is just awesome. if you do this, place them over indirect heat until the dough looks cooked through, then move them over to the flame side for a little char. keep an eye on them, the dough will burn if you’re not watchful! otherwise, preheat the oven to 450 and bake for 12-15 minutes. feel free to slide these onto your pizza stone if you have one, just make sure it has preheated for at least 30 minutes. 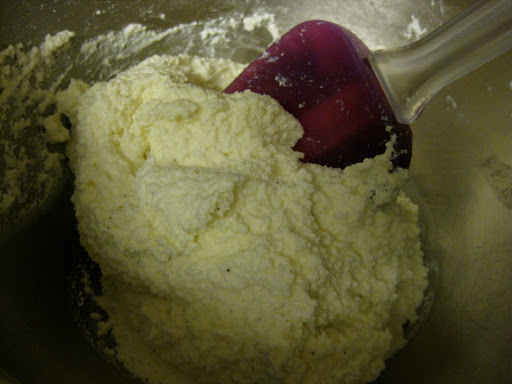 in a standing mixer, add the flour, yeast, salt and sugar and stir together. fitted with the dough hook, add water and olive oil and mix until the dough just begins to come together. turn off the mixer and let it rest for 10 minutes. after it has rested, turn on the mixer to medium and knead the dough for about 8-10 minutes, or until the dough is smooth and elastic. place dough in a lightly oiled bowl and cover. let it rise until about doubled in size, 1-1 1/2 hours. 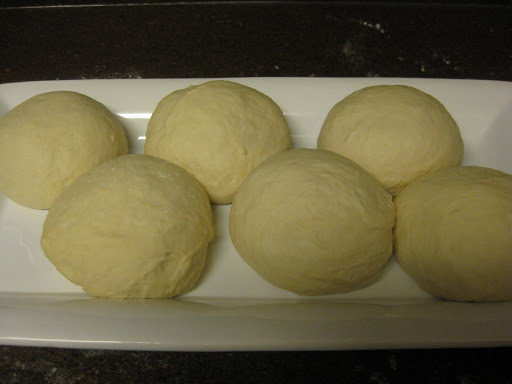 remove dough from bowl, knead for a minute then divide dough into four 6 oz portions and shape into smooth balls. let rest for 10-15 minutes before using.